If I ask V any time what he wants in his lunchbox, his immediate reply is Egg Biryani. For me, it is very difficult to stick to one recipe. So I try to make it a little different each time. That makes lunches more exciting. I made this couple of days ago and it was very delicious. 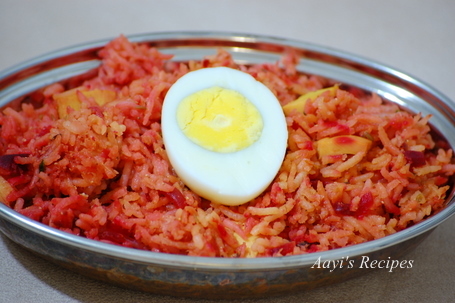 The recipe is based on a Egg rice that I had tasted many years ago. I have got some kind of beetroot craze these days. I add it to many dishes and I love the sweetish taste that it gives. If you are not a beetroot lover, leave it out completely. Paste : (Fry everything in little oil and make a paste. Do not add too much water). Cook rice with whole cardamoms, so that each grain is separate(I use little less than 3 cups water and cook the rice in cooker). Keep aside. Heat a little oil and fry all the spices listed under paste. Then add ginger, garlic, onion. Fry till onion turns brownish. Add coconut, tomatoes and fry for few minutes. Grind to a thick paste. Heat ghee/oil in a big thick bottomed pan. Add cumin seeds, curry leaves. Add onions and fry till they turn brownish. Add beetroot pieces, a little water, cover the lid and let it cook. Now add the paste, salt and fry for new minutes. Peel the eggs and cut into small pieces (you can also cut them in halves, I use only egg whites and cut them in bite size pieces). Mix well. Now add rice and mix well. wow look at that colour. Would love to grab a plate with some spicy raita. lovely recipe. Lovely simple recipe, may be I will replace the egg with boiled potato pieces. Now that is what I call a coincidence….. I was getting ready to post the same…. but minus the egg of course…. I was surprised to see you, already post it….. & I was Like….. Oh!!!!!!!! But yummy I must say & know it too…. Thanks for this recipe, I never knew any rice recipe with beetroot earlier and this turned out really well. All of us loved it and it was all gone before we knew it. I know someone who adds beetroot to fish curry and it looks really deadly without being sweet. Thanks for the recipe.I tried it out and it came out well! An excellent recipe. I am a great lover of beetroot. I never thought of using it with rice. Thanks for this recipe.